The larvae feed on a variety of herbs, particularly species in the families Acanthaceae and Scrophulariaceae. Mature larvae have a black body with minute yellow spots and numerous short spines; head black with an orange patch and 2 spines. 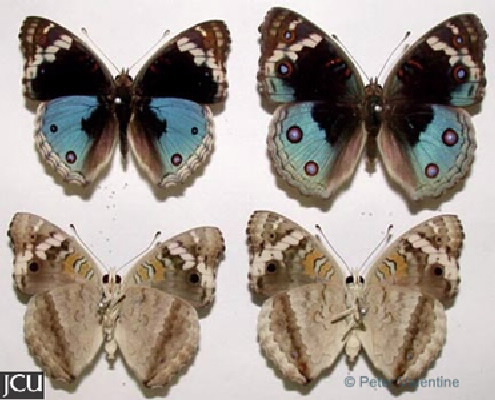 Adult has the outer portions of the wings scalloped, fore wing is black with a white diagonal band and some white spots; hind is bright blue with 2 spots in the wet season form; lower surface pale brown with a variety of markings in orange and white plus black/blue eyespots.